Just one book in this week's giveaway, but it's a beauty. "Aesop's Fables" - this edition by Munro Leaf with illustrations by Robert Lawson. 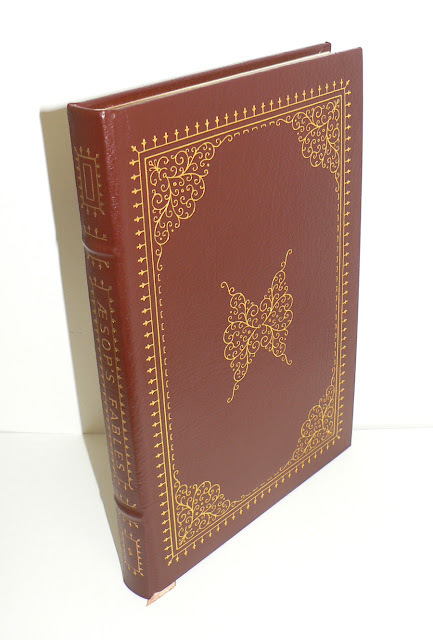 It was published by The Easton Press (1979) in beautiful full leather, silk moire endpapers, and sewn-in silk ribbon marker. Perfect condition. This would be a beautiful addition to my starter library! Love it! My dad used to read me Aesop's fables when I was little. This has been a favorite for generations in our family. My old books were handed down to the oldest daughter. Terrific book. Please enter me in the drawing. Oooh, I'd love to win this so I can read the fables to my impending baby girl! Thanks for the opportunuity! forth my full speed. I challenge any one here to race with me." The Tortoise said quietly, "I accept your challenge." I love Munro Leaf, beautiful book! These were my favorites, growing up. Throw my name in the hat? Lovely book and great blog! Thanks for a chance to win the giveaway. If I win or not, you'll hear no sour grapes from moi. Thanks! Wonderful! I first learned of Aesop and his fabled fables, as I did about many things-- from cartoons. Aesop & Son, a regular feature of The Adventures of Rock & Bullwinkle. Please enter me for this, it's lovely! Such an awesome collection of stories! A beautiful book! Please include me in the giveaway! Thank you! How beautiful, and not only pretty but quite useful, especially since I started a special topics class with 2nd/3rd graders on Aesop's Fables. Fingers crossed. It is so lovely and so beautiful! A beauty indeed! Here's hoping. . .
A beauty indeed! Here's hoping . . . Please enter my name for this drawing. Gorgeous book and I've never read any of Aesop's fables! Thank you for this opportunity! Here's to hope! Aesop's fables were my favorite as a child! Cool!! Thank you for the chance to win! Just about perfect! Count me in please. 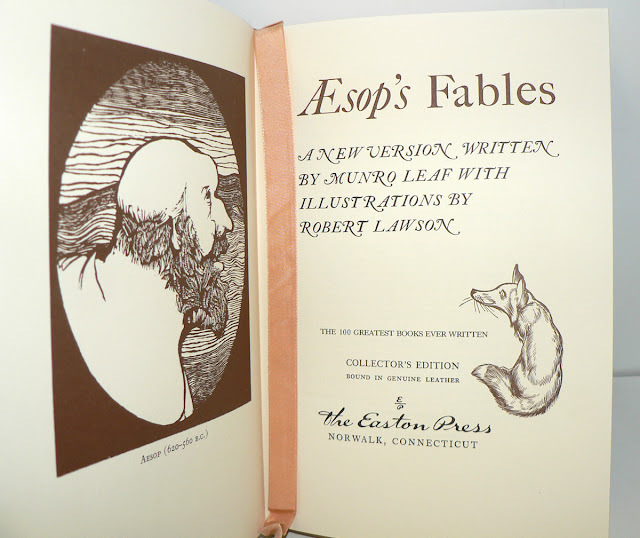 I would love to have Aesop's Fables in one, bound volume! Oooo, yes please! How beautiful!! Thanks for having these terrific giveaways! Deligthfull book, i hope today i am the lucky one! This will look so good in my library. What a lovely book. Please enter me in the drawing. great looking copy! aesop's and grimms are responsible for my reading habit. Beautiful! I've been looking for one of these for a long while now! Beautiful tome. I would look great on my bookshelf....and feel wonderful when reading it! That really is a beauty, and the Lawson illustrations are the icing on the cake! Thanks for offering it! Just one, but a good one!! Thanks again for the giveaways! would really enjoy having this one! count me in, please! Count me in -- what a beautiful book! I have other Easton editions and enjoy them all. I haven't read Aesop's Fables in many years. This would be a lovely way to introduce them to my children. Beautiful edition! Would love to read these stories to my grandchildren! What a lovely edition. I would love to add it to my collection. Gotta get in on this one, signe me up please. Oh dear, I hope I can still enter.